The mole’s piles of soil are very noticeable in autumn and upset gardeners. Moles do not live in deep forests, they also avoid sandy or waterlogged places. Gardens, parks, grassy areas and forest verges have to take the damage. It is amazing that the “miner”, weighing on average less than 100 grams, is able to push up a soil pile of about a kilo to the surface. 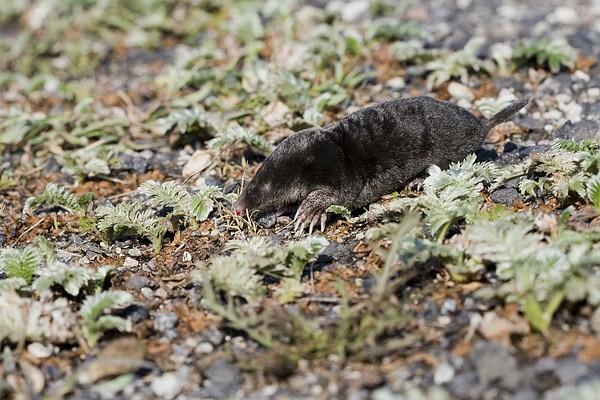 The cylindrical body of the mole is covered by fur, at its most valuable now as winter coat. Without powerful feet and claws no one trudges around down in the soil. The eyes of the mole are tiny, hidden in the fur; it is rather helpless moving above ground– the eyesight of this underground inhabitant leaves much to be desired. External ears are absent, so hearing is rather poor too. The nose and upper lip are joined – like a snout, but well developed for groping along and smelling. It seems sufficient for orientation in a mole’s world. In a day the mole needs food equivalent to three-quarters of its body weight. The staple food is earthworms (the mole collects and stores them, paralysing the earthworms by its bite and placing them in some blind end of a tunnel), all kinds of insects and their grubs. In famine carcasses will do – if it finds them. The mole does not hibernate; it moves below the freezing line of the soil.